Lets face it, many belly dancers love, collect and quite possibly are addicted to the magical cloth from Egypt, Assiut. Over the years, dancers have performed in assiut dresses, have worn shawls and scarves artfully draped, tucked and twisted into their costumes, and covered bedlah sets with this distinctive cloth. It has a look that is both exotic and unique, the metal embroidery on mesh ground cloth providing a rich luster and sheen, draping and conforming to every contour of the body. One of the first of these epics is the 1916 DW Griffith masterpiece, Intolerance, which featured costumes made from assiut in the Babylonian and Egyptian scenes. By using fabrics actually from Egypt, although totally modern in construction and design, the film evoked the exotic otherness of a an imaginary and timeless Middle East. You can see in this film still assiut cloth draped over the the shoulder of an actress in the far left bottom corner. Throughout the early days of film, when assiut cloth represented the luxury of travel and a mythologized east, it became symbolic of an educated, well traveled bohemian lifestyle. From the start of the British Occupation of Egypt in the 1880’s to the peak of assiut collecting fervor in the 1920’s, starlets off screen would collect assiut shawls to wear as elegant accessories or even as garments themselves. Clara Bow Hollywood’s "it girl" wearing an assiut shawl transformed into a glamorous dress held together by some discreet stitching and a pair of strategically placed cords. Off screen, assiut shawls appear in publicity stills and on informal photographs. In a time of exotic masquerade themed parties, costumes were made from anything laying around, and assiut were popular to work into revealing costumes. Here, Clara Bow has captured the center front of a rectangular shawl at her neck with an unseen cord, and wrapped the fabric to the back, creating a pleated, almost bustle-like drape in the back. For the sword and sandal cinema classic, Sampson and Delilah (Paramount,1949,) award winning Hollywood costume designer and courtier to the stars, Edith Head was called upon to design a collection of alluring costumes for the legendary femme fatale. One of these ensembles was the amazing two-piece ensemble cut on the bias to further emphasize the contours and curves of the gorgeous actress. For this, and the other costumes worn by Hedy Lamarr in her title role as Delilah, Edith Head went won the academy award for best costumes in 1951. Dame Elizabeth Taylor attends the Macys Passport Gala 2007 at Barker Hanger on September 27, 2007 in Santa Monca, California. Elizabeth Taylor 2007 – Maintaining a stylishly subtle connection to Egypt and her hallmark roll of Cleopatra by donning a lovely assiut robe. Though no assiut was used in the production of costumes for the film, Cleopatra, Taylor collected quite a few examples of the hallmark cloth from Egypt and wore them at public appearances in her later years. 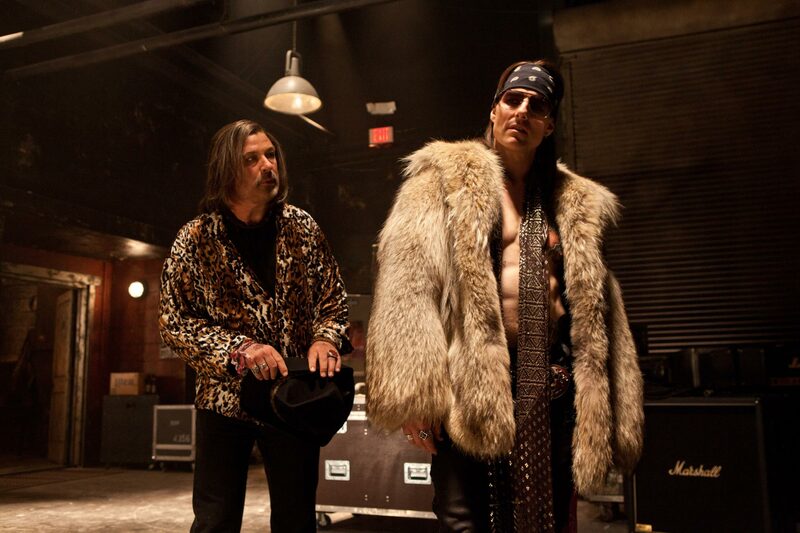 Most recently, Tom Cruise was spotted wearing a vintage assiut scarf for his staring role in the film Rock of Ages. For Tom’s role as Stacee Jaxx, costume designer Rita Ryack channeled the style of ’80’s rocker Axl Rose. The look is spot on, and Ryack completely captured the "I raided grandma’s attic" look that was de rigueur for the rockers of the time. Hollywood’s costume designers, and the actresses they clothe, will continue to grace the motion picture world with quick glimpses of this amazing cloth. Next time you’re at the theater, keep your eyes peeled! Have you seen a movie clip or still featuring a piece of assiut? Why not let us know in the comment section below! The Oriental dancer (as an improvisational artist) performed in collaboration with live musicians, and the shared goal of both dancer and musicians was to create authentic shared emotional experiences (known as “tarab”) both for themselves and the audience. Another portion of our Cairo 1991 street footage. At the time that this was shot, it was difficult to find Mahmoud’s costume shop in Khan El-Khalili. We recorded this for the benefit of the dance community. Now Mahmoud has a fancy new shop that is easier to find. This is presented now for historical purposes. More annotations will be added soon. Beautiful article! I would love to see more research on the use of Western pastness in the belly dance community. I jsut finished my Master’s in Anthropology on the proliferation of vintage/vaudeville fashion in Tribal Fusion. Mia Farrow wears an assuit dress in Death On the Nile. I was looking at an image of Gloria Swanson in “Sunset Boulevard” and I can’t tell if the shawl she is wearing at the end is assuit or brocade. Thank you for this article as the pictures are amazing and I have always loved the picture of Hedy Lammar in “Samson and Delilah”–not assuit but the peacock costume at the end is fantastic. I became a big fan of Theda Bara (silent Screen Actress known for her role as Cleopatra and The Vamp). I collected everything I could find on her. In the movie , Cleopatra, Assuit is everywhere. It is hanging and draped on pillars, tables and of course actress’. The silent film of Cleopatra was destroyed in a fire on the Fox lots. Most of Theda Bara’s films were lost in that fire. I always wished I could visit the costume lots as later they did not have much regard for assuit and had quite a collection starting from the early 1900’s. Great Article and pics as always Davina. Assiut turned up in the Spring 2013 Versace Men’s collection. After you stop being distracted by the models, you can actually see the assiut used as tunics, robes, trousers, shorts (my favorites) and vests. Tom and Lorenzo’s selected pictures.